Do you need more leads? How about conversions? Yes, these are rhetorical questions. Every business needs more business! Optimized landing pages - whether for direct sales, lead generation or relationship building - increase conversions. Hosting a landing page on your website increases online traffic, builds brand awareness and develops trust. But, if this short answer doesn’t answer your query, read on. Here’s more reasons you need landing pages designed for conversions on your site. First of all, what is a landing page? It is essentially a page where you want your visitors to land to in order to take action. That's why a landing page tool is the ultimate lead generating solution, to increase your conversion rates and accurately match a consumers immediate ask. I know your homepage is rockin’ (I hope - you’re a smart business marketer and you’ve A/B tested it, right?). But your homepage doesn’t have the single focus objective that your landing pages do. Yes, you can get traffic to click on your homepage. Those visitors might get interested enough to explore your site further, or even sign up for one your homepage CTA’s. But, when 96% of first time visitors to your site aren’t ready to buy, sending people to your homepage doesn’t bring in the profits and relationship-building opportunities. A well-planned, single-focused, fully-optimized landing page however, does. Let me show you what I’m talking about…. The Wishpond homepage has an optimized lead-generating CTA. It also has a navigation bar with dropdown menus to direct viewers to 100 or so website pages. More than 90% of first time visitors navigate to a secondary page. 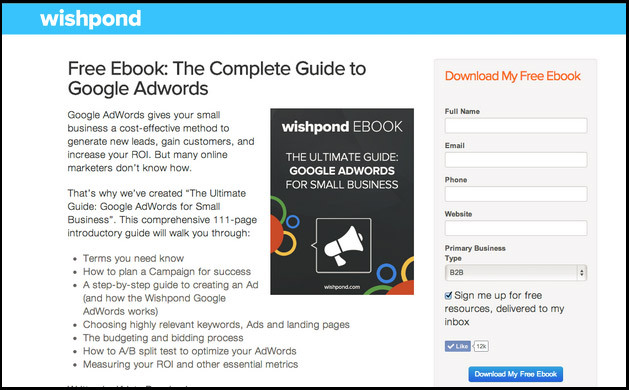 Wishpond ebook landing pages, on the other hand, are singly focused on one CTA. Our ebook landing pages have a conversion rate of more than 32%. Why the massive increase in conversions? A standalone landing page gets traffic from people who’ve clicked on your ad, searched for your specific offering, converted on an email campaign and so on. They’re looking for exactly what you’re presenting on your website landing page. Another awesome thing about the single focused website based landing page? It’s easy to drive traffic with direct online ads. In a Google AdWords campaign, your landing page can rank a higher quality score than your all-encompassing homepage. It’s specific and relevant. Your targeting methods sharpen, allowing you to hone in on your exact demographic. Your PPC costs are lower, while your conversions increase by getting the right customer to click through. Are giving away your new ebook? Are you changing your business logo? You (or your website developer) can build landing pages directly on your website for each of these marketing objectives. If you’re launching a new product, generate buzz with your current customers and new visitors through a “pre-launch” landing page. Engage your consumer and let them be the first to know about your product developments through email, or even set up a weekly landing page engagement tactic (such as a vote contest, sweepstakes or coupon giveaways). You keep your business top of mind with interested prospects. By doing so, your marketing touchpoints rise, as do your conversions (and even repeat customers). Keep each landing page devoted to one specific ask to remove friction on your page and increase conversions. Are Landing Pages Something New in Online Marketing? No. Landing pages have been around for over 15 years. Heck, I remember way, way back (like in 1999) when I had one of the very first Amazon affiliate websites. (Remember when Jeff Bezos was considered an estranged Wall Street wolf turned west coast nutter - I mean, who would be buying products through a website, right?) Anyway, even back in the last millenium, I had landing pages for each book product I was selling. Jeff Bezos (and other fathers of e-commerce) knew way back then that to sell a product you needed a distinct and unique page, with a clear, focused CTA. 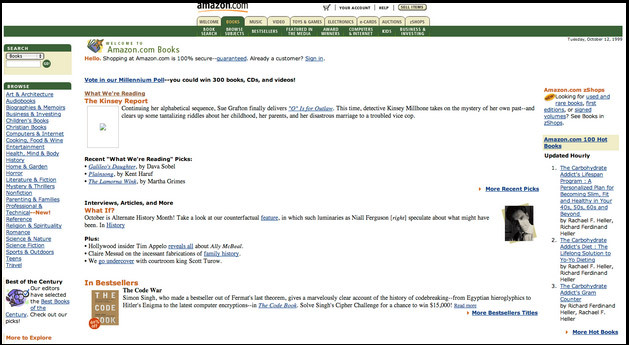 In 1999, Amazon had a distinct landing page for each product, with customer reviews, information about the product and their signature recommendation of other books you’d like. Their shopping cart CTA button was on the right hand side in contrasting colours surrounded by whitespace (all still best practices for landing page design). If you’re still sending people to your homepage and crossing your fingers with the hope they’d follow your product to the final ordering stage, your business is losing sales and conversions. It’s a tried and true no-brainer fact that your website needs specific, singly focused landing pages. So no, landing pages are not new. But, what is new and developing since the infancy of online commerce? How us marketers now use landing pages. You can achieve all of these objectives directly on your own website through clever and strategic landing pages. Is One Landing Page enough? Hopefully you’re convinced of the value of a conversion-getting landing page. But wait - I’m now going to prove that one landing page is really not enough. Regardless if you have an e-commerce site (with multiple product pages), a B2B site, a service site or a brick and mortar store site, the more landing pages you have on your site, the more likely your visitors are to convert. In fact, websites with 40 or more landing pages get 12 times more leads than a website with only 1 to 5 landing pages. Okay, okay, clearly a small website (probably run by a small business) doesn’t get the leads of a massive site chock full of landing pages like WalMart or eBay. It doesn’t get the traffic either. But, the more genuine and related landing pages you have, the more opportunities you’re giving your interested viewers to convert. From those conversions, as a marketer, you’re able to send out personalized, segmented emails. Hook your prospects by continuing the connection. Invite them to more of your landing page campaigns. Give people more of your awesome free content, run another sweepstakes, or crowdsource a new product label. Show your customers you value their input and treat them like a consumer who’s set foot in your brick and mortar store. You’ll generate amazingly-warmed leads for your sales team. Oh, and hey, if you’re looking for high converting landing pages for your business, check out my article 21 Ways to Generate Leads from Your Landing Page - there’s lots of marketing strategies your business needs to be implementing right now. And there’s really no excuse to have only one landing page. What’s your experience? How many landing pages do you have? How do they increase conversions, leads and sales for your business? What type of landing page tool do you use? Don’t deny yourself this free opportunity! Check out our “ Complete Guide to Landing Pages” ebook. Click on its distinct landing page and you’ll be super glad you did! Thanks!